Birmingham Airport has launched a security system based on biometric technology. It uses iris-scanning technology to identify travellers and speed up immigration checks. Project Iris, the Iris Recognition Immigration System , is to be rolled out at airports across the UK, and Birmingham Airport's Terminal 1 is now fully operational using the system. Instead of waiting in long queues, those who sign up for the Iris scheme can just walk up to an automated barrier at the airport, and look into its camera. If the passenger's iris pattern - stored in the database along with passport details - is recognised by the system, they will be granted permission to enter the UK. The scan takes about 20 seconds to carry out. 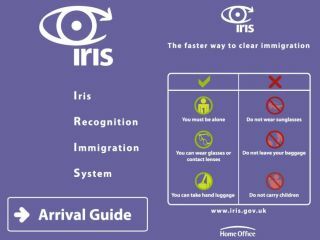 Iris was launched at Heathrow Airport in March last year. So far, the system is used at Heathrow's Terminals 1-4, Manchester Airport 's Terminals 1 and 2, Birmingham Airport's Terminal 1, and Gatwick Airport 's North Terminal. Gatwick's South Terminal is due to have the system installed this year. More than 61,000 people have already registered with the Iris system across the UK. So far, the system has handled some 210,000 border crossings, a Home Office spokeswoman said. Registration is free and takes five minutes. It is conducted by immigration staff in each airport's departures area. A valid passport and boarding card is needed in order to register.